It was a summer day in July at MetLife Stadium and the expectations ran as high as the mercury did in the humid, sweltering heat of New Jersey’s Meadowlands. Duquesne’s Christian Kuntz and Saint Francis’ Lorenzo Jerome were both present in the Coaches’ Club that day, helping to ceremoniously kick off the 2016 season at the second annual #NECFB Social Media Day. Months earlier, they had squared off in a winner-take-all 2015 regular season finale at Duquesne’s Rooney Field. Now, these two all-Northeast Conference performers were about to embark on their senior seasons. They would have one final chance to leave their mark on the NEC and the Football Championship Subdivision. As it turns out, they didn’t disappoint. 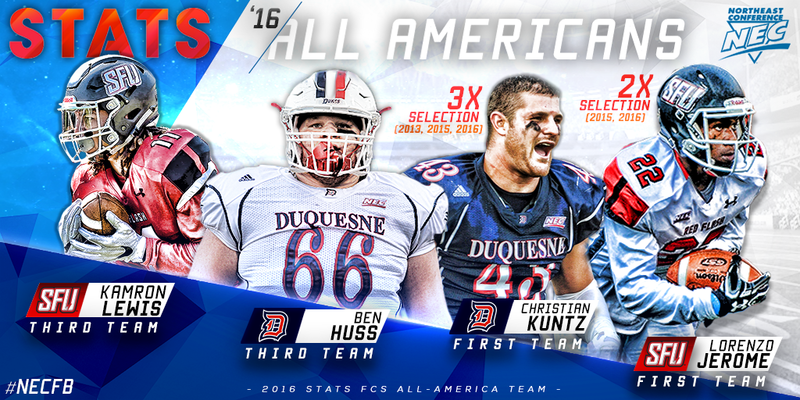 When STATS Inc, one of the leaders in NCAA FCS coverage, unveiled its All-America Teams on Tuesday, December 20, Kuntz and Jerome found themselves on the First Team. It marked the first time ever that two NEC players were named to the First Team in the same season. In all, four NEC players achieved All-America status as Saint Francis wide receiver Kamron Lewis, the NEC Offensive Player of the Year, and Duquesne offensive guard Ben Huss earned spots on the Third Team. What’s On Your NEC Christmas Play List? Even the #NEChoops schedule comes to a halt (albeit a brief one) for the holidays. The five days from December 24 through December 28 will be hoops-free. Although the games are off, the music will be on. Just what will your favorite NEC players and coaches be listening to as they sit by the fire? Gary Wallace in the NCAA Tournament. Basketball is in their blood. Northeast Conference alumni Gary Wallace (Robert Morris) and Latif Rivers (Wagner) both enjoyed successful collegiate careers on the hardwood, and, even a few years after graduation, they aren’t ready to walk away from the game. In fact, both men are embarking upon new challenges. Wallace, a North Jersey product who played his high school ball at Seton Hall Prep before a fruitful career in Moon Township, is set for his first season as a head coach. The former NEC champion has taken the reins at Montclair High School. Meanwhile, Rivers, who played at Elizabeth High School before eventually landing at Wagner where he scored 1,513 career points, has won a roster spot for the world-famous Harlem Globetrotters. The Associated Press set off the annual wave. STATS Inc will soon follow as will the AFCA, the FCS ADA and HERO Sports. The AP unveiled its Division I Football Championship Subdivision All-America lists for the 2016 season on Thursday, December 15 and three Northeast Conference representatives made the cut. There was plenty of conversation in Piscataway where the NEC hosted its first-ever Mental Health and Medical Issues Summit on December 1.